Prior to this hike, I had been on three other trips down to the Huachuca Mountains. On each of those excursions I had walked into the mountains to look over old mining operations that had been active in the late 1800's through the early 1900's. 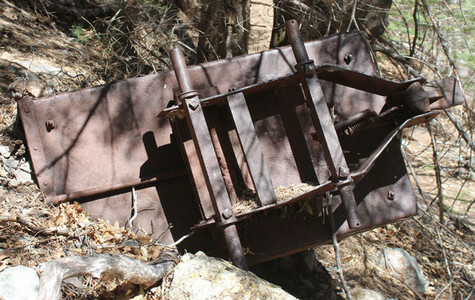 When Leonard Taylor, author of the Agave Guides, extended an invitation to accompany him on a walk into Ramsey Canyon to see the remnants of the old mining operations that were described in his "Trails of the Huachucas", I jumped at the opportunity. 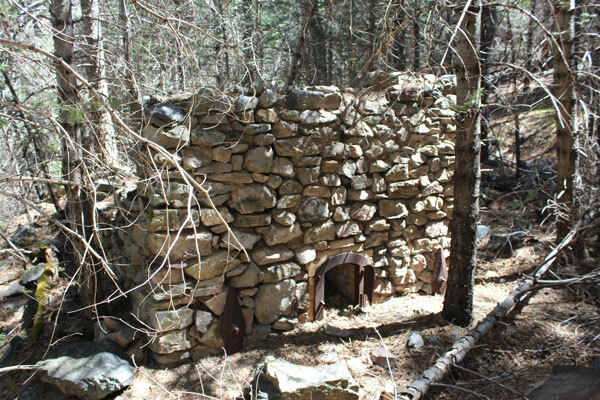 Historically, the mine sites that we visited were once part of the Henry Hamburg group of more than 20 copper and gold claims that were located in upper Ramsey Canyon near the junction of Pat Scott and Wisconsin canyons. Newspaper articles from the early 1900's noted that Hamburg was a tireless promoter who frequently traveled to New York City and Chicago looking for investors. He was apparently pretty successful at that mission although in later years there seemed to be several conflicts between he and his stockholders. 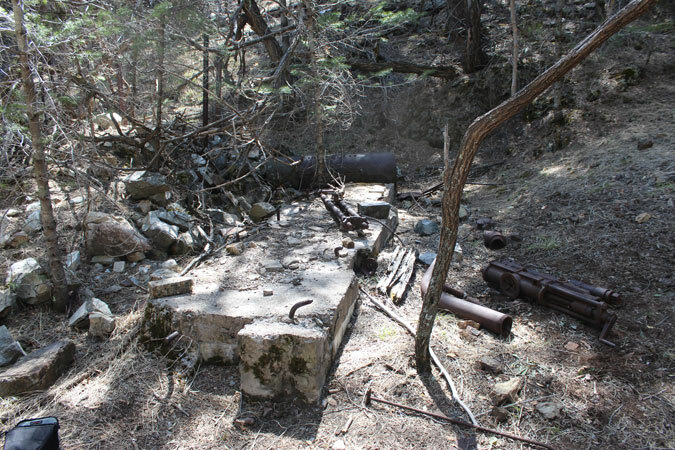 An Arizona Department of Mines report stated that the Hamburg Mines were active from around 1900 to 1914. There were 100 tons of recorded production from the sites. The quality of the ores and the particular metal content was unknown. Despite the very limited production, there seems to have been a lot of activity in those early years. A sizeable camp named Hamburg sprang up in Ramsey Canyon, a couple of miles above its mouth. Jim Sherman, in his "Ghosttowns of Arizona", wrote that the camp supported about 150 people, mostly miners. At one time, there were saloons, general stores and boarding houses. A post office was established in 1906. Today, about all that remains of the camp are a few scattered, leveled-off areas bounded by rock retaining walls. The first operation that we really explored was located approximately 2.5 miles above the trailhead just above the junction of the two canyons that come together to form Ramsey Canyon. We were in Pat Scott Canyon. There are no large pieces of machinery remaining in the area today. 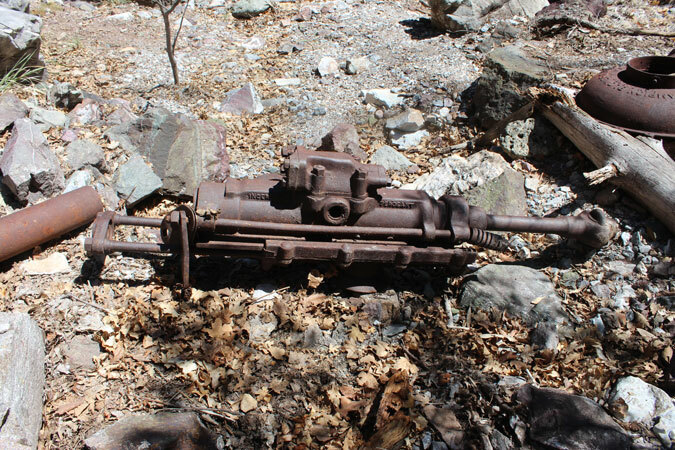 Those were gathered up in World War II scrap metal drives conducted to support the war effort. 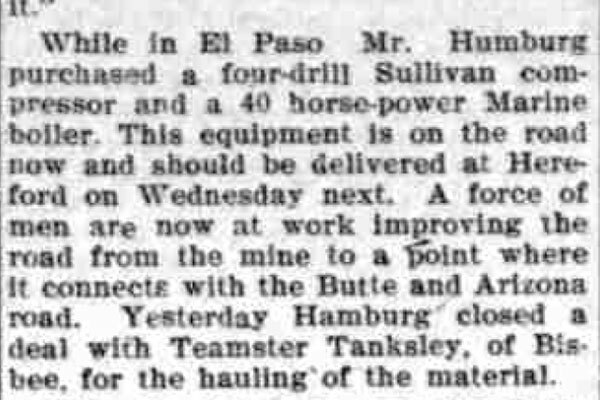 An excerpt from an article published in the Bisbee Daily Review in 1906 provides some insight into the kind of equipment that was to be set-up. 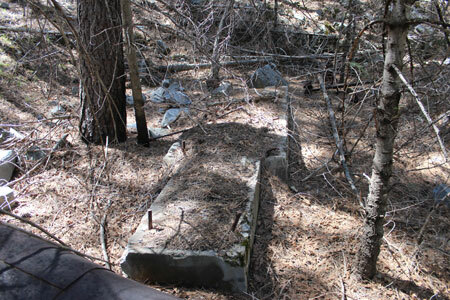 A prominent structure at the first mine site is a large concrete foundation. 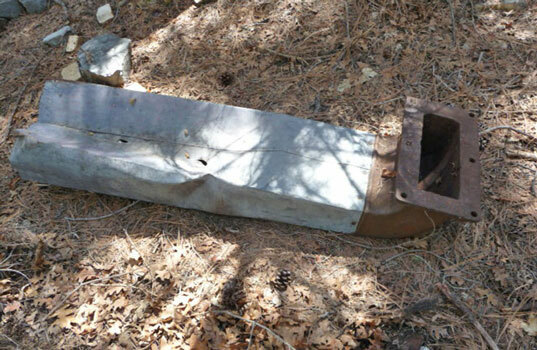 Was this the base for the Sullivan compressor described in the newspaper article? After we returned home, a 1902 Sullivan Machinery Company catalog was located online. Included in the catalog were illustrations and descriptions of the compressors that the company currently had in production. 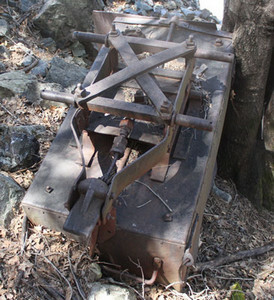 With what was learned from the catalog, and what was seen scattered around the first mine site, we think that we have identified the type of machine that was mounted on this concrete base. Images of the early compressors in the catalog reveal the purpose of the pair of thick metal rods that were seen resting on the foundation. Those were connecting rods used to transfer output energy from the steam engine to the compressor's flywheels. 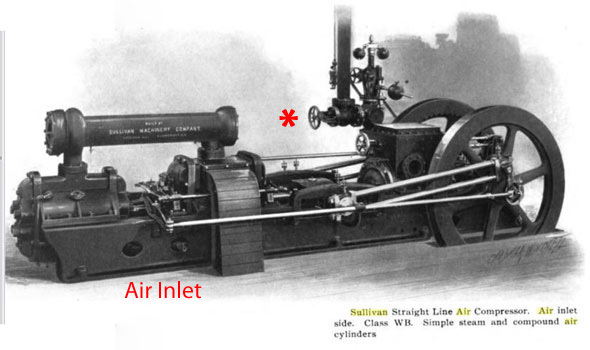 The two models of compressors that used this style of connecting rods were a single stage steam compressor model "WA" shown below and to the left, and a two stage steam compressor model "WB" shown below and to the right. 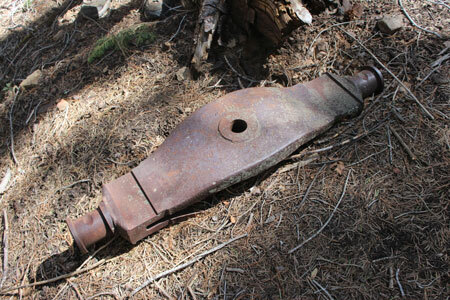 One of the pieces of "mystery metal" that we had photographed at the site was a heavy, axle-looking piece of iron about 2' in length. An illustration and description in the catalog identified the piece as a "crosshead." The crosshead was listed as a component of the WB two stage compressor. It appears from the drawings that crossheads were also used in the single stage WA compressor. 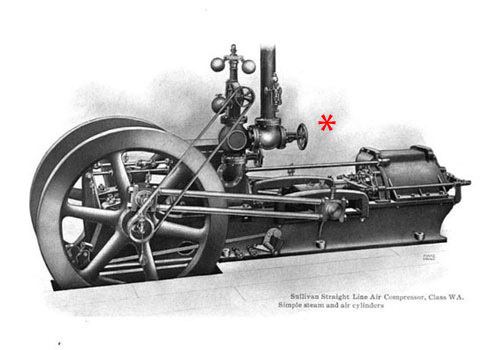 The crosshead was mounted between the steam cylinder and the low pressure air cylinder. Crossheads are shown installed below the "red *" in the compressor photos above. 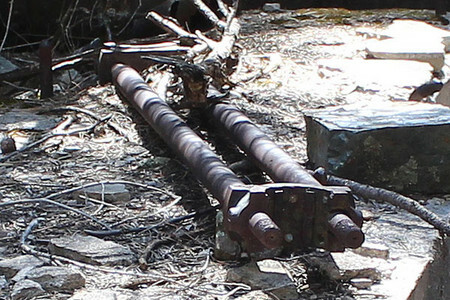 The flywheel connecting rods were attached to the outer ends of the crosshead. 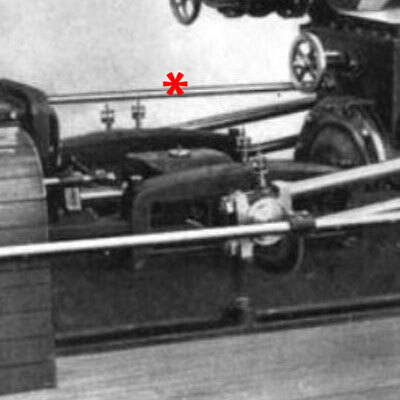 As the crosshead was moved back and forth by the action of the steam engine, driving force was transferred to the air cylinder and to the flywheels. 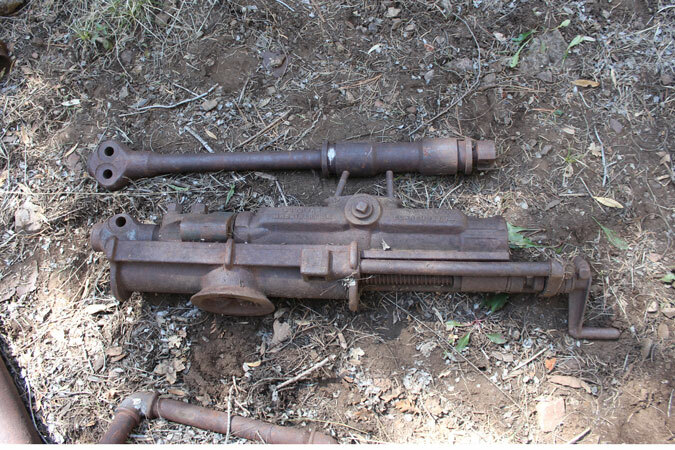 With the presence of the connecting rods and the crosshead at the site, we thought that the foundation was the likely base for one of the two types of the old Sullivan compressors, but which one? Leonard noticed that there was a "notch" in the foundation. The location of the notch matched correctly to where the air inlet "conduit" would have been located on the two stage compressor. The single stage compressor did not appear to have the side mount air inlet. If there would have been an option for one, it would have not been located at the position of the notch on this foundation. Near the old foundation was a very interesting old Sullivan Rock Drill. It was drills like this one that put the Sullivan Company on the map so speak as a quality producer of mine excavating machinery. Markings on the drill indicate that it could date back as early as 1901. 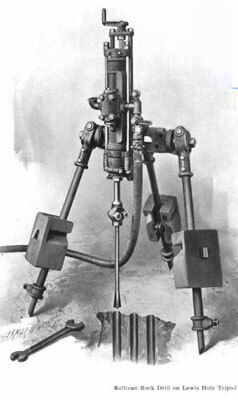 These images from an early Sullivan Machinery catalog(a different catalog than linked to above ) show similar rock drills in their "all up" operating condition. The Sullivan Company took great pride in the durability of their drills. One reason for their confidence was that there were fewer parts used in their drills' construction as compared to the competition. As an example, a one piece piston and chuck was used in the rock drills. An example can be seen in the photo above. 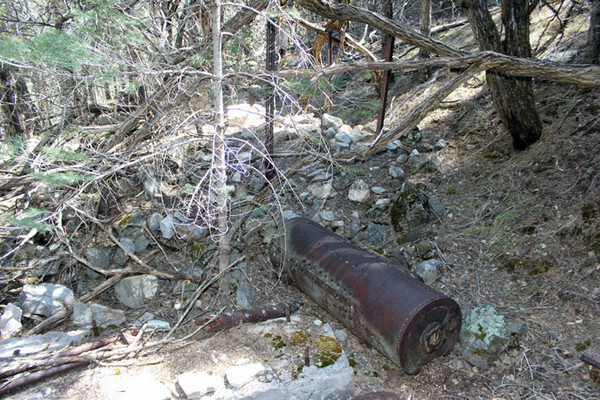 Also to be seen near the old compressor foundation is an old air receiver. 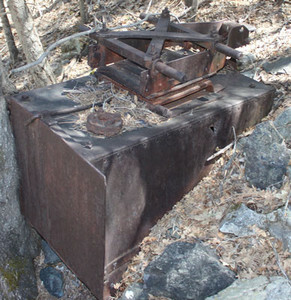 The firebox for the associated boiler may have been on the raised ground just beyond the receiver. 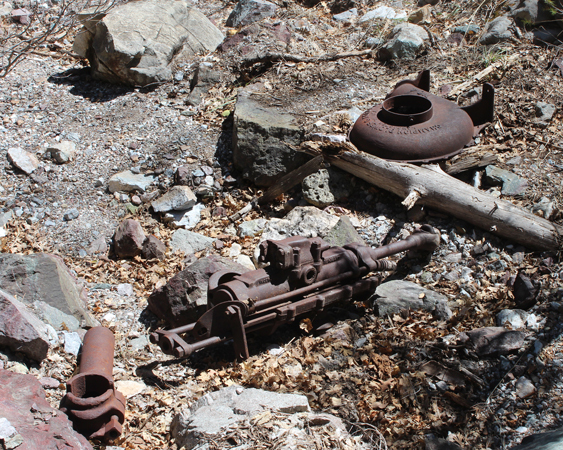 A few yards up canyon from the concrete foundation is a very large mine dump and other old mine relics. There were at least two fairly complete ore cars that seemed to be missing only their wheels. 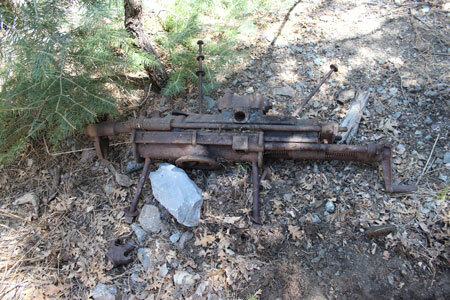 Among the relics at this location was another old rock drill. This one was manufactured by Ingersol Sergeant. Ingersol Sergeant became Ingersol Rand in 1905. 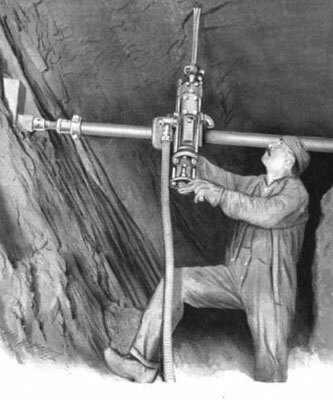 These early rock drills would run on either steam or compressed air. Not too many years before this time period, holes in rock had been drilled by hand! The second mine site that we headed for was back down the trail and then up a smaller unnamed canyon a short distance. Interestingly enough, there was a second boiler site and a large concrete foundation that was very similar to the one that we had just seen. But, there was more to the co-incidence. An identical looking crosshead was seen here. And, in addition, there was a rectangular air inlet flange off of a two stage compressor as seen in the Sullivan catalog. The flange still had its attached "conduit" as described in the 1902 catalog. 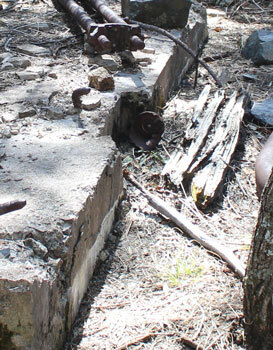 This evidence leads us to believe that there was essentially the same compressor setup here as at the other mine site. 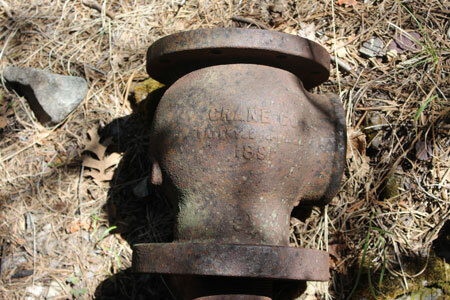 A pipe fitting that we had photographed because of its old patent date and its unusual diameter of 3 1/2" turned out to have a possible connection to the Sullivan Compressors. In the 1902 catalog, there were 10 slightly different configurations of the Class WB compressor that were available. Two of those configurations used 3 1/2" piping in their steam system plumbing. There are very detailed specifications listed for the different configurations. It is possible to know many of the engineering details for each of the configurations. So, not only do we have an idea which model of compressor was set-up in this area, but have a good idea which configurations were likely to have been there! Old photographs of early mining operations from the late 1800's to early 1900's almost always show very tall chimney flues attached to old boilers and other steam equipment. Probably the most intact one that I have seen was here at this site. We measured the one section to be more than 30' long. Another separate section, if added, would have brought the total height to more than 40' perhaps 50'! 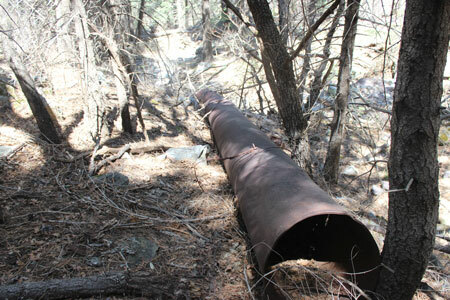 When together and standing, the pipe may have extended above the trees! The flue had been put together by riveting together 3' sections of flue pipe. There was still a working damper and a piece of guying cable attached to the flue. At the first site that we had visited, the mining operations were located just a few yards from the boiler/compressor site. From the second boiler/compressor site, the mines are at least a 1/4 mile further up the canyon. 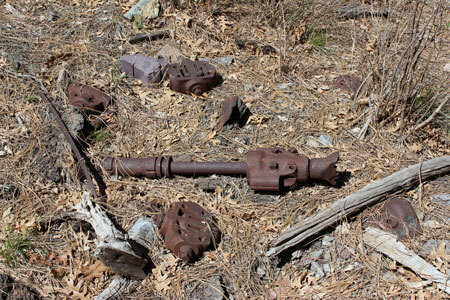 At that location, there is a large dump and a few scattered relics including old mine rail and another old Sullivan rock drill and associated parts. There is no longer an opening to the mine. 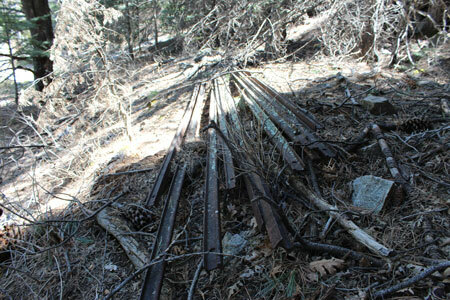 Further up on the ridge is another old site with few relics but a considerable stack of mine rail. Earlier in the day, on our way up the Hamburg Trail toward the first mine site, Leonard had shown me what he believed to be an old saloon/bootlegger site. 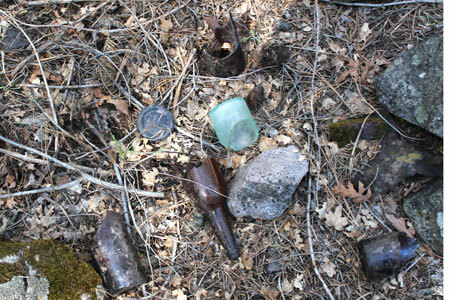 There were numerous broken liquor bottles and a few pieces of copper sheet metal scattered about. Many of the bottles had embossed maker 's marks that were fun to research once I had returned home. The more interesting maker mark was to the far right in the photo below. It is "A.B.G.M. Co." This was the mark of the Adolphus Busch Glass Manufacturing Company which was the bottling company for the Anheuser Busch Brewery. The bottle could date back to 1908. Information on the other marks can be seen by clicking on the photo below. 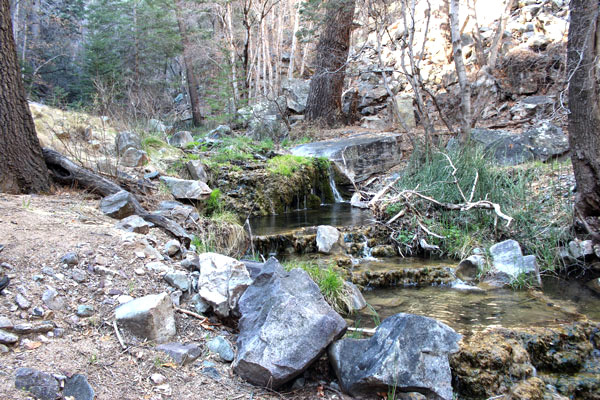 By far, the majority of hikers in Ramsey Canyon are there to walk alongside the perennial stream or to catch a glimpse of the native wildlife. Very few probably come for its mining history. On this trip, I was there for the latter. There are essentially two trails to enter lower Ramsey Canyon. The most direct route is to use the Hamburg Trail which is accessed through the Nature Conservancy Preserve located at the mouth of Ramsey Canyon. The other route uses the Brown Canyon Trail to bypass the Conservancy property. The Brown Canyon Trail connects to the Hamburg Trail above the Preserve. A disadvantage to using the Nature Consrvancy preserve as an access is that there are designated hours of operation, limited parking and a fee schedule for the right to cross. The rules, regulations and the fee schedule can be seen here. Note that the only parking is on the Conservancy property. That being said, the Preserve does have outstanding scenery and it proclaims itself to be one of the hummingbird centers of the world. The gradient of the Hamburg Trail is much less steep than many of the other trails in the mountain range. 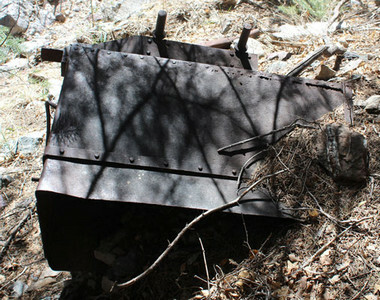 For much of its length, it follows an old wagon road that was constructed to access upper Ramsey Canyon. There is only one steep hill to be negotiated as one leaves the Nature Conservancy property. The fall colors in the canyon are supposed to be outstanding. The "Trails of the Huachuas" guide provides great detail to hiking in the area.